The Canadian Science Writers’ Association has recognized our Giant Walkthrough Brain projects as a valuable contribution to the communication of science. Here is the original post from the CSWA awards site. The Giant Walk Through Brain by Trevor Day, Jay Ingram and Christian Jacob. In 1972, neuroscientist Joseph Bogen suggested building a giant 60-story high science museum of the human brain. This giant walkthrough brain would educate and engage students and the public by taking them on guided tours inside, making it possible to visualize anatomical relationships among structures surrounding them. Although this architectural project remains an intriguing idea, the cost makes it unlikely an actual walk through brain will ever be built. However, modern computer technology and advances in computational human anatomy models provide another avenue for exploring a three-dimensional virtual human brain. Our team has developed “The Giant Walk through the Brain”, an innovative, engaging, narrative-driven public science communication performance which takes a live audience on a larger-than-life virtual tour of the human brain. 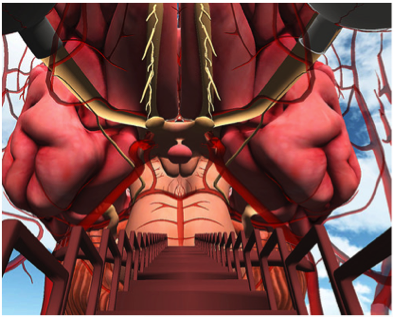 “The Giant Walk Through Brain” is a live theatrical performance, including engaging, story-driven narration, dramatic 3-D computer animations and original live music. Dr. Trevor Day is a neurobiologist and Associate Professor at Mount Royal University in Calgary, Alberta. He is music director and leader of the five-piece band “The Free Radicals”. They have written original music to accompany the narration and guided 3-D tour of the brain during the live performance. Dr. Christian Jacob is a Professor and director of the University of Calgary’s LINDSAY Virtual Human Project and the leader of the animation team. They have developed custom-made, scientifically accurate 3-D models and animations in the form of interactive fly-throughs to support the scientific and narrative content of the performance. Science broadcaster Jay Ingram wrote the narration and acts as tour guide for The Giant Walk Through Brain performance. He is a member of the Order of Canada with 30 years of broadcasting experience with CBC Radio and Discovery Channel, author of 13 books and co-founder of Calgary’s Art, Science and Engineering festival Beakerhead.